This post has been pending for awhile now, it's simply been a matter of finding the time to sit down and compose it, post, and cross-post it. A year of dead zone for updates here and no new works since July 1st on Deviant Art, where be the arts, where be the Vulne 'o' Pros dudes? I have posted about this in the past and, again, I'm dropping an update to give a somewhat brief overview of what I've been up to; taking care of my Father as he embarked on 'The Magical Medical Mystery Tour part 2 Electric Boogaloo'. Yes, the latter half of 2013 was pretty busy with the lead up to another surgery, left carotid artery (70% stenosis) endarterectomy. His surgery was last month (the 22nd) and, once again, went well (he had a great surgeon, the same as in 2011) save one complication... he had some cognitive impairment that led to an extended stay hospital inpatient (normally you're discharged in 24 hours for this procedure) and additional extended care/physical therapy for 21 days. His surgeon was not completely sure if he had a TIA (mini stroke) or possible anesthesia hold over, however he was very positive that my Father would recover cognitively pretty quickly though and we'll get to that. So it's been a lot of driving back and forth for pre-op appointments, hospital and extended care visits and making sure he was doing well, etc, etc, etc. I have no intention to post endlessly (as I echoed the last time I posted updates of this kind in 2011) about all this because I was never big on the whole "tell everyone what you're doing 24/7 social media phenomenon" (not to denigrate anyone else from doing so) and, also, it would just be exhausting to post about it with regularity. I care deeply about how my Father is doing otherwise I wouldn't be doing all I have to make sure he comes though all this but I'd rather post about the work you've all been following than an endless drone about this. It hasn't been some kind of non-stop terrible experience anyway (ups and downs sure but things have, for the most part, been significantly better than they could). Being it's not terribly fun to post about this kind of stuff I'd rather just do overview updates when it seems I should so here we are. I would have liked to get to it sooner but there simply hasn't been the time. My Father was discharged from extended care Tuesday, the 18th, and is now home. The assessment was he would have a lot of issues with basic tasks such as going to the bathroom but I was never sure if I completely saw that was an absolute certainty. It seems I was right because once he got home he has somewhat fallen back into his routine (he is able to get around on his own but I keep an eye on him as he's still not 100%) and the first thing he did was use the bathroom all on his own, no problems (the door was open so I could make sure he was alright). He also has some home care for a time to additionally help but he seems like he needs it less than expected (pretty much all he has for Family to help is myself and his brother who lives up north of us in Davidson MI). It's typically better for a patient with any degree of dementia or memory issues to be at home in a familiar environment so hopefully the trend will be his returning to a comfort zone of routine. It's too soon to tell how things will be but it's looking like he'll be back to his old self or enough so that he'll be reasonably self reliant. None the less I still watch him like a hawk but I'm seeing that's he's adapting to the familiar home environment quickly. Obviously, this is why there hasn't been any new works or posts for some time. Although it's been a hectic time I actually have been reasonably productive considering what I just reported. Last year I had been involved in a live action pitch project that may or may not see the light of day and I had continued to work on TKP materials whenever there was any time to do so. Indeed there's a bit of a significant pile of TKP works waiting to be posted, it's just a matter of getting around to all of it (actually a peek at some of that work was previewed on my Facebook page, now one here below, and you can expect to see more soon here and on the Deviant art gallery). We'll see how the landscape looks as things settle down for my Father but I expect I'll be able to get back to posting and sharing new works soon. 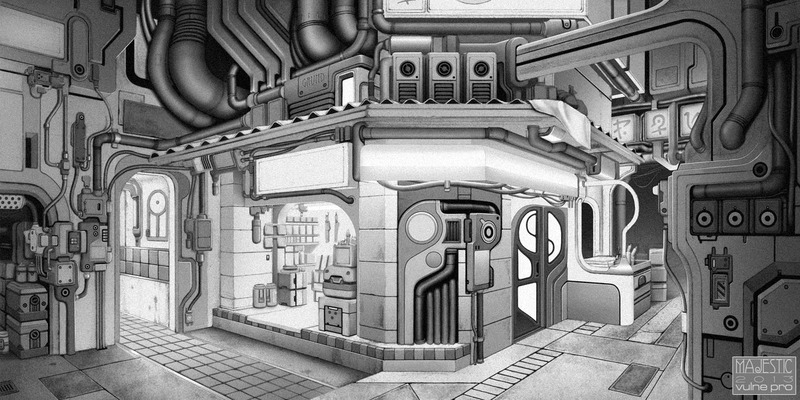 The image below is background layout in pencil with additional digital gray scale tones in CS3. I don't mind sharing this overview of what's going on but unless things go south any future updates on My Father will be likely brief and hopefully positive. We certainly do appreciate any well wishes but I'm not actively seeking sympathy, we're doing well and the best we can. Again it's gone pretty well considering. As always I deeply appreciate the interest in Vulne Pro's works and Theos project. Any comments, Deviant notes, email, etc that were unanswered now you understand it wasn't willful ignoring of anyone on my part. I'll see if I can get to some replies to those comments as I can. Thank you everyone and you should most likely see some new stuff this year so stay tuned! Hi Mike. Thanks for the update. Hopefully the medical adventures will be over for a while, but the next time you find yourself off on some task in support of your father don't forget to pack a sketchbook for those spare moments. I forgot who said it, but I've heard it mentioned that a sketchbook is like a balancing pole on the tightrope walk of life. Best wishes to your father as he gets back to normalcy and leaves that depressing hospital stuff behind him. Glad to hear he's doing better - take care of both of you's! First of all, redeem your product key at www.norton.com/setup. Now Proceed with your My Norton account sign in at www.norton.com/myaccount with your Norton account. If you don’t have an account yet then create a new one and use the same Norton login credential to sign to your My Norton account. Once you have successfully completed with the step one. then Select Install of your product, select Install again. By default, this installs the 32-bit version of Norton on your PC using the language you selected when you redeemed the product. But If you want to install the 64-bit version, change your language.